Something that we artists do not give much thought to-estate planning. 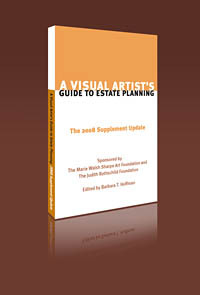 The Marie Walsh Sharpe Art Foundation offers a book (also available as a PDF) that is intended to be a comprehensive handbook meant to aid artists in planning their estates-practical and legal issues. If you don't want to miss out on future articles posted here at the Rio Rancho Art Blog, be sure to sign up for the email subscription box on the ride side bar on this blog! Safe and secure-no spamming and no sharing of the email address will take place as a result of your signing up!